Today’s buzzComix incentive sketch doesn’t have much to do directly with M. Night Shyamalan’s The Village, but it’s pretty close. It’s Tom as a pilgrim, folks. Dig in. I had a tough time coming up with a way to make fun of The Village. Originally I was going to do a strip where Tom was in control of a nerve center dedicated to uncovering the secret “twist ending” to the film (“I’ve received a credible lead from my contact in Zurich!”). He didn’t know what the ending was, but dern-gummit, he knew there was a twist! Ultimately I couldn’t find a punch line for the setup, so I abandoned it. Still, I think it leads us to an interesting discussion. Jared and I were actually talking about it yesterday. 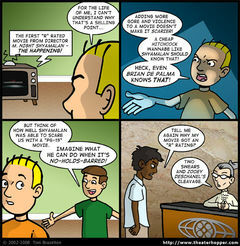 How much harder has it become for Shyamalan to surprise his audience when they go into his movies EXPECTING a twist? It’s kind of the difference between going into a haunted house when you’re a kid versus when you’re an adult. When you’re a kid, you have no idea what’s around that next corner and, in your mind, those monsters are REAL. When you’re an adult, you’re kind of predicting when something is going to leap out at you. That primal fear is gone, but you’re still being entertained because you remember how seriously you used to take this stuff when you were younger. Out of all the movies being released this week – The Manchurian Candidate, Garden State and Harold and Kumar Go To White Castle among them, The Village is the flick I want to see the most. If anything, but to learn if my theory regarding the movie’s ending are proven true. I haven’t spoiled the movie for myself and read anything online about it, but I have my own thoughts as to what the twist could be. If you have a brain stem, you’ve probably already established the obvious thought. But in case you’re stemless, I’ll keep my theory to myself until next week. I have good news for fans of the THorum. I received word from my former hosting company that the DNS transfer has been submitted. So hopefully Theater Hopper will be seen from it’s new server in the next 48 hours. You shouldn’t be able to tell a difference on your end. We’ve prepared things in advance so the change over should be pretty seamless. The biggest change will be that the THorum will be open so we can discuss all of the latest films! Lastly, be sure to check out our new advertiser Dunn Boyz. 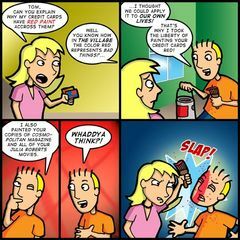 This comic has been around for a while and it’s still as fresh as ever. I read this strip a lot before I started Theater Hopper. I love the art!